When our plane landed on Saturday is was grey, snowing and the avalanche risk was high. Not exactly the perfect start to a 9 day vacation with ski mountaineering as the main goal. 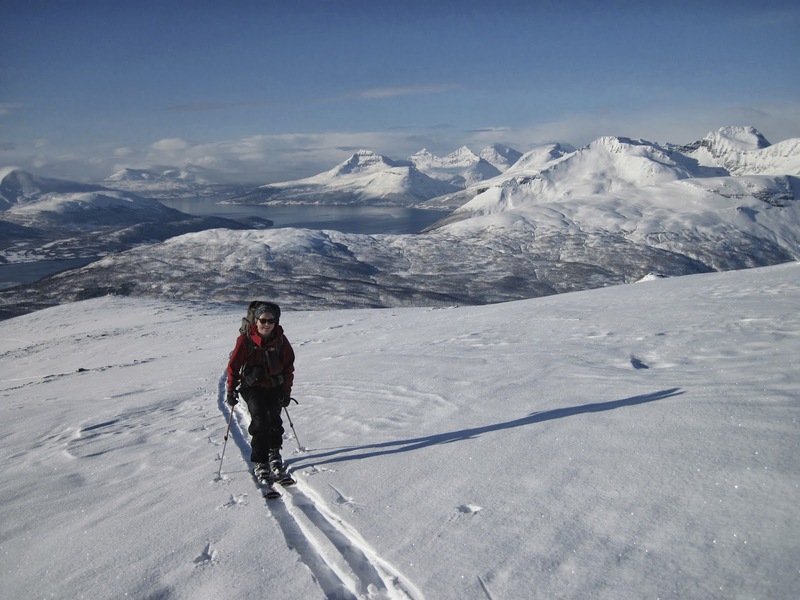 But we trusted in the weather forecast, which called for sunny skis the next day, and planned a trip up Daltinden, a classic peak on the southern half of the Lyngen peninsula. The next day dawned sunny as promised, but the tunnel and stretch of the access road to the peak turned out to be closed, due to avalanche danger. So we turned around and drove off towards our second choice, Storgalten, on the southern tip of the peninsula. Storgalten is peak I would usually consider fairly mellow. According to our guide book, a short part of the ascent occurred on a slope of around 30 degrees, while the rest was less steep. In avalanche terrain, 30 degrees is kind of the magic number. 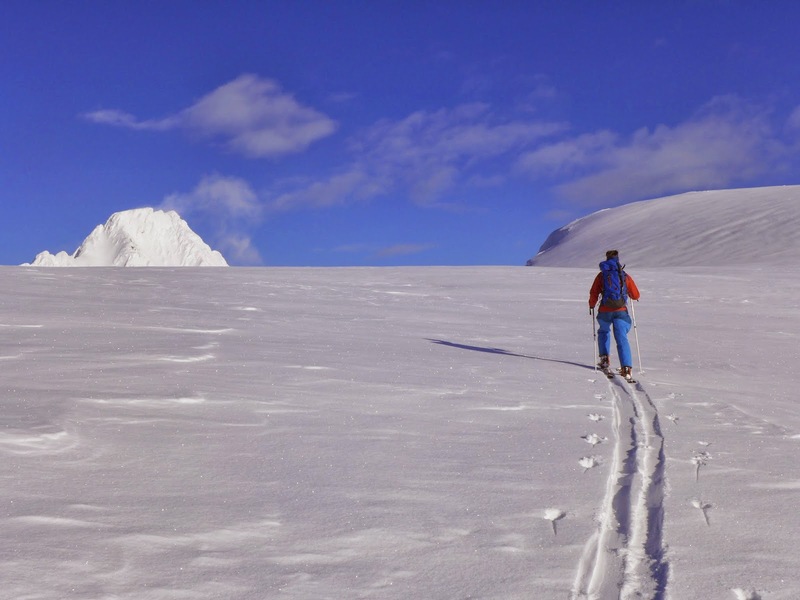 If the snow conditions are prone to avalanche, it usually takes a slope of 30 degrees or steeper to trigger a slide. So a simple way to avoid dangerous conditions is not to ski steeper than 30 degrees. On the other hand, anything a lot flatter than 30 degrees can be a little boring to us. 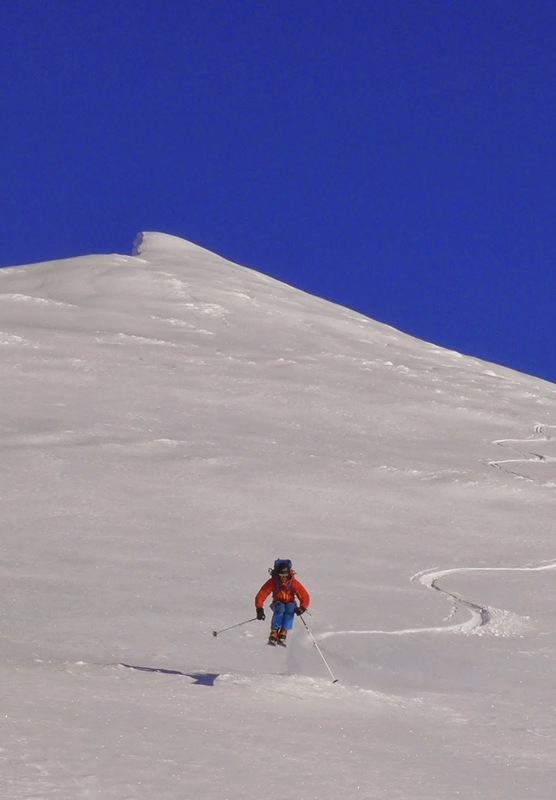 The challenge was thus to pick a peak which steep enough to be fun skiing, but not steep enough to be truly dangerous. 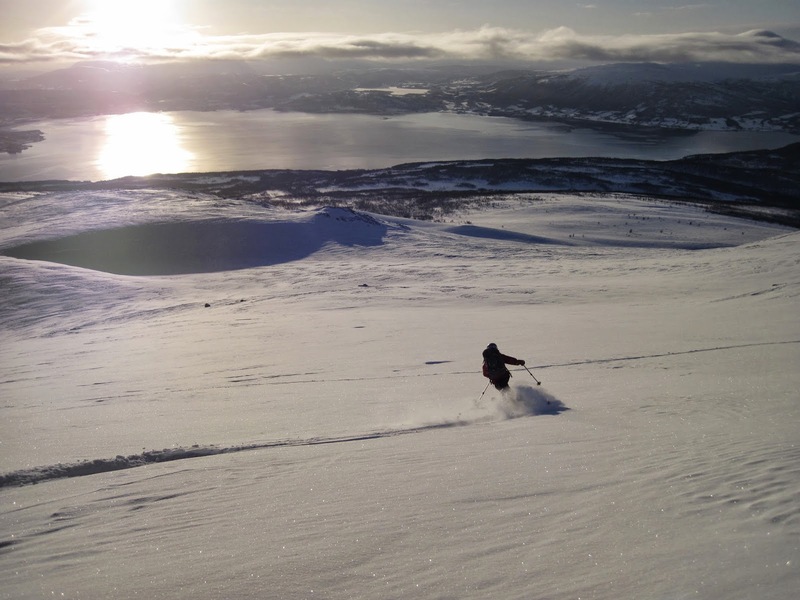 The snow conditions on Storgalten were extremely variable. On the ascent we crossed everything from crusty, icy snow to wind pack to powder. That alone is unsettling, because it means you can't predict what type of snow you have in front of you. 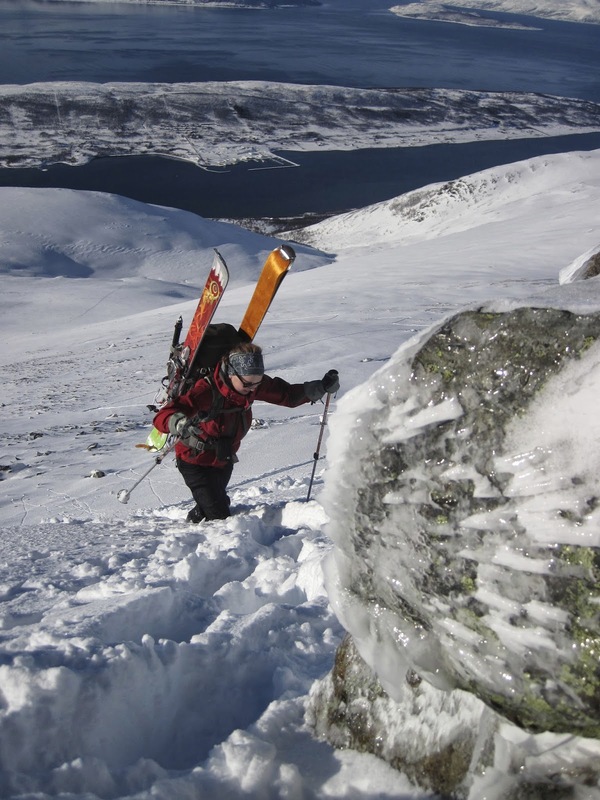 We carried our skis up a rocky ridge, before putting them on again when the rocks turned into powder. The view was amazing - fjord, mountains and blue sky stretched out beneath us. We were following a group of 7 foreigners (Swiss we think) with a guide. About 200 vertical meters from the top, they abruptly stopped, took there skins off, and turned. We continued to skin up to the point where they had turned, discussing what must have gone on. "Maybe they thought the snow was unsafe?" I asked nervously. "Maybe they were just tired," Audun countered. "We'll see when we get up there." At the point were they turned, there was signs of digging a snow pit (to check for avalanche danger). We dug a couple of our own, one each. Deep in the snow, there was a thick, icy layer which clearly would be a problem if it slide, but seemed like it would be hard to trigger. The snow on top was mostly light and fluffy, but compacted in some areas in a way that could produce a slide. In addition to the avalanche danger, we also debated where the Swiss had disappeared to. They had skied down the slope at a reasonable speed 15 minutes before, but were yet to appear in the valley bottom. Unsure of the snow conditions, and worried that something had befallen the other group, we made the decision to turn around and ski down. The Swiss were fine, and the skiing down the upper part of the mountain was good fun. On the drive back to the lodge, we saw a huge avalanche go off across the fjord in Brevikeidet. 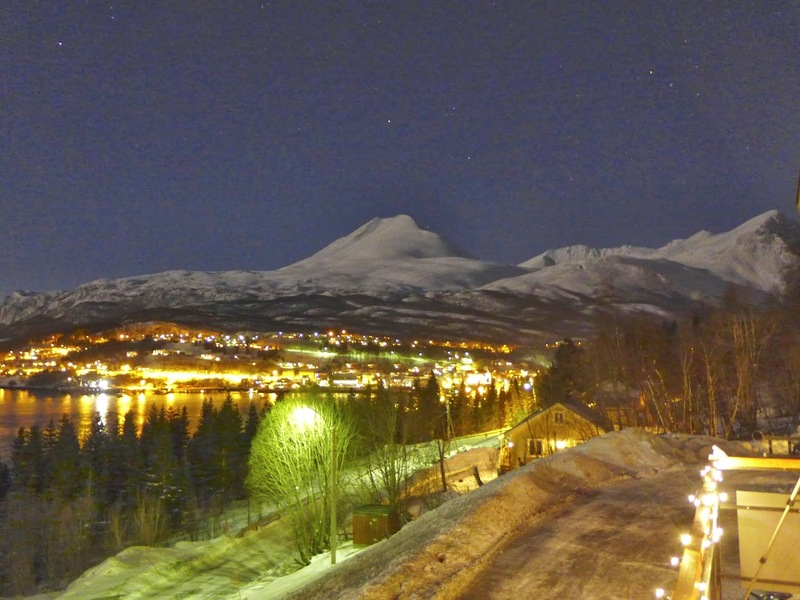 Almost simultaneously, a reporter on the radio announced the death of a snowmobile driver on a mountain in Lyngen earlier in that day. Those two signs alone made me glad I turned. The next day, we decided to try for Storvasstind, a long, flat ridge traverse capped off by a short, steep climb to the main top. Again, the weather was on our side, even if the snow conditions (i.e. avalanche danger) was not. The flat looking thing on the right is the ridge of Storvasstind, the pointy-looking thing in the centre of the picture is Piggtind. To get onto the mountain, we had to ski several flat kilometers of snow mobile trail through the forest. Not much fun on big skis with skins! We meet a friendly local with his dog, who zoomed by us on skinny backcountry skis. The ridge was, as promised, long and flat and offered spectacular views of the neighbouring peaks. Although the sun was warm, it was cold out. It had been -15 C at the car, and was probably never warm than -5 C all day. Enjoying the day - looks warmer than it is. We finally reached the area where the ridge starts to get steeper and pointer around 2 pm. With sunset at 5.15 pm and complete darkness by 6.30, I wasn't interested in spending too much longer ascending. Still, the summit did look really cool. There were no tracks after the snow mobile trail at the beginning of the day. We were alone in the mountains. As the ridge steepened, we started assessing the snow again. 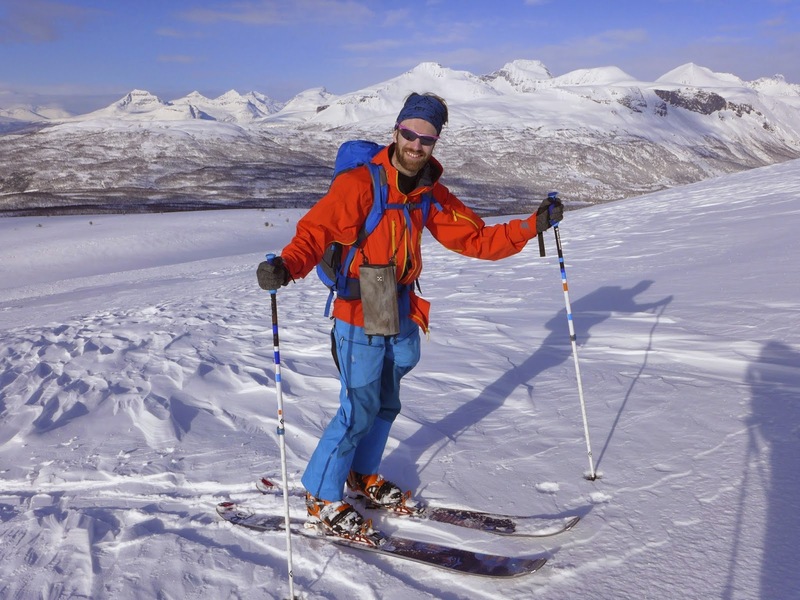 We thought is seemed pretty safe, but as Audun so politely put it, "If this face slides, we are f***ed." 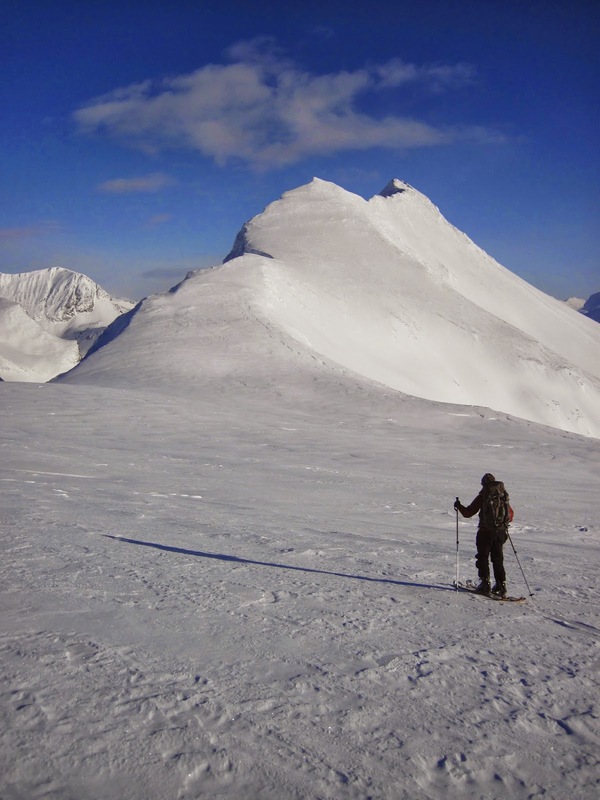 We spent a while try to decide where to take our skis of and put crampons on to climb around and up to the main top. It looked kind of scary, as the ridge between the first and main top was corniced and we have to side-step around on a steep slope. 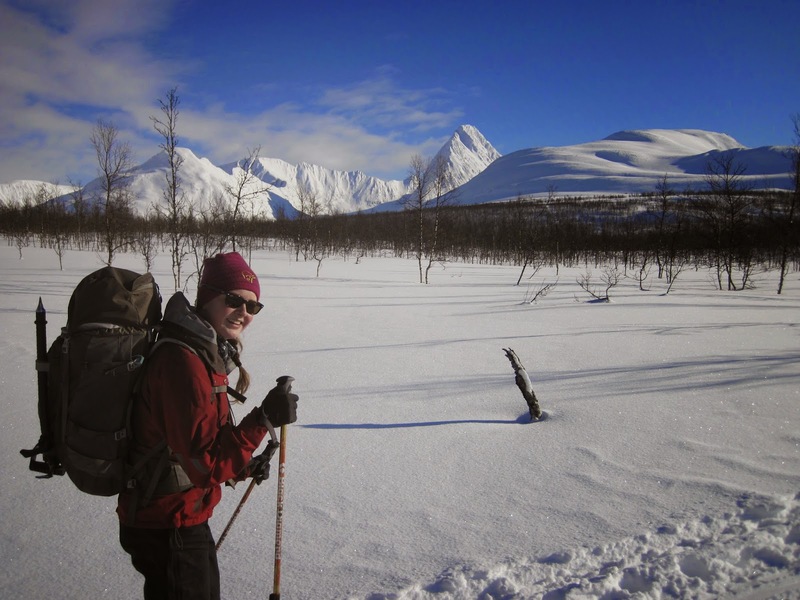 I was nervous, and when Audun said, "I'm starting to have a bad feeling about this," I had to agree. We didn't have time for mistakes, and we weren't confident enough to not make mistakes. So we turned, and enjoying cruising back down the long, long ridge. 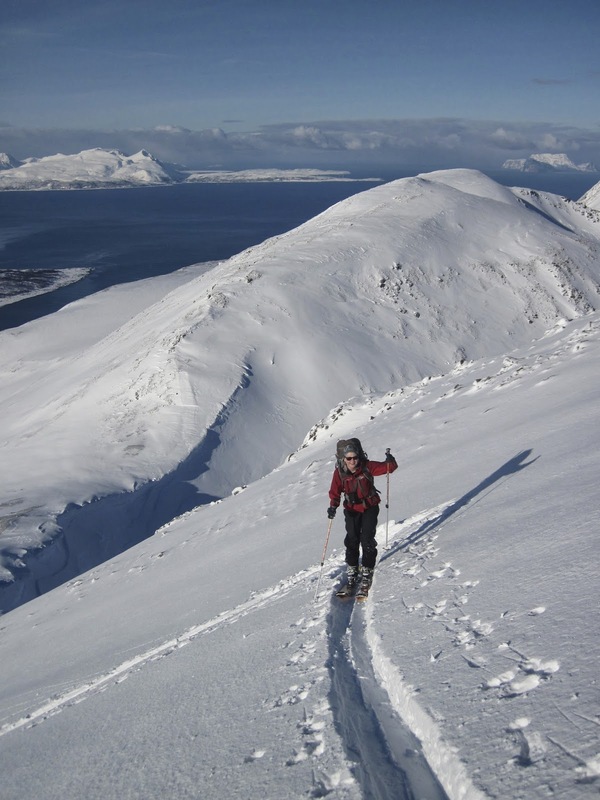 Audun descending from our high point of the day, just below the first summit. 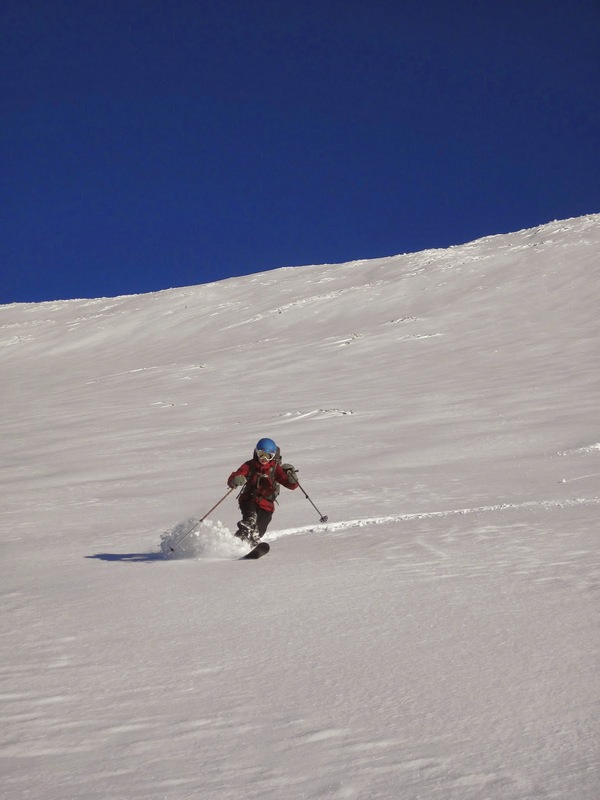 Me cruising in slightly wind-packed powder - no too shabby! 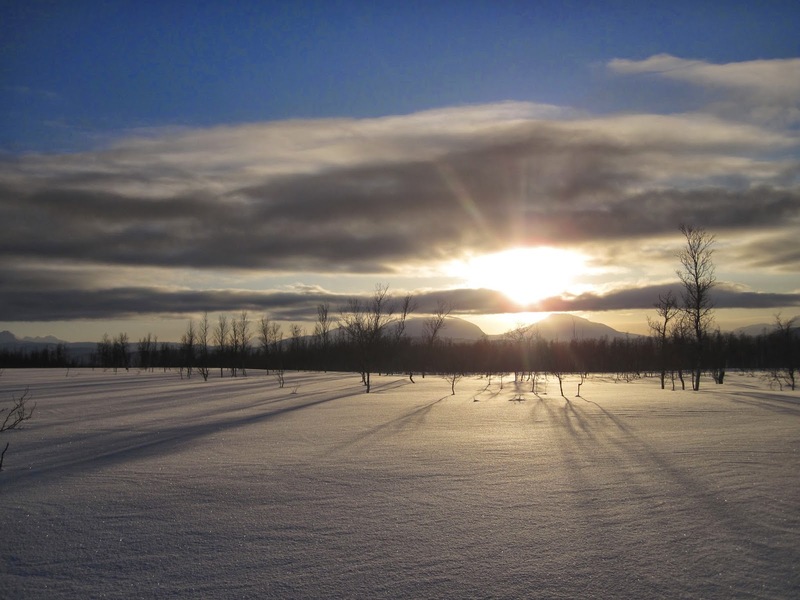 We had to pole out through the long snowmobile track in the forest, but were rewarded by spectacular light. So two days, two peaks not conquered. Would we be have been fine if we pressed on to the tops? Probably. But you can make stupid decisions and get away with it. I'd rather air on the cautious side and turn too early then become another avalanche statistic. Flott innlegg, dere er så flinke til å utnytte de mulighetene dere har til å leve:-) Og så bra at dere snudde:-) Vi har fulgt med på meldinger om stor skredfare og ber dere instendig om å ikke ta sjanser. Samme hvor fristende det er.. This is gorgeous! 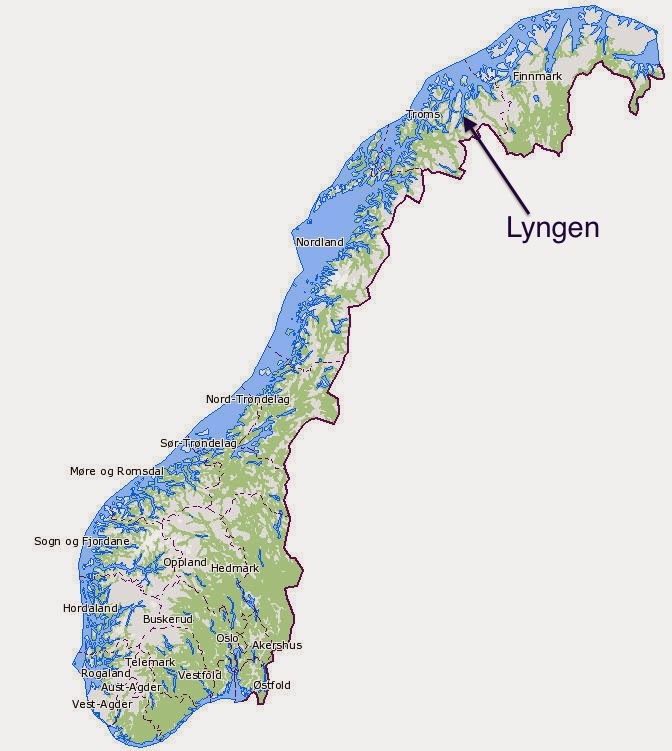 I have family in Norway, so I a had already google searched to find Lyngen on a map before I got to the bottom of the post. That's really far north, but wow, incredibly beautiful! I want to come adventuring in Norway with you!! Norway can be incredible, although there's a lot of bad weather. We're really lucky that this is our vacation week here! We have had a lot of avalanches here in Montana as well this winter, with some deaths. Be careful! Avalanches are definitely scary, I don't take them lightly!